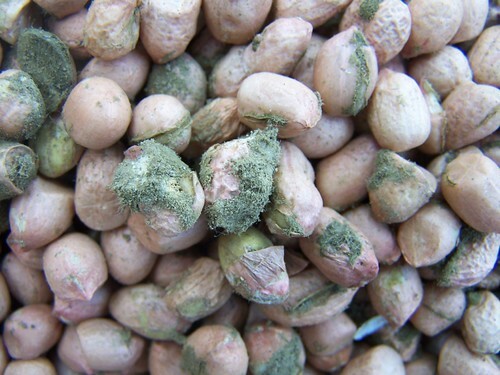 Aflatoxin-contaminated groundnut kernels from Mozambique (photo credit: IITA). Among the many research projects carried out by the Food Safety and Zoonoses program of the International Livestock Research Institute (ILRI) is one that aims to reduce the risk of mycotoxins in the feed-dairy value chain in Kenya so as to improve food safety and safeguard the health of consumers of maize and dairy products. The project is developing cost-effective and incentive-based mycotoxin control strategies and solutions for use by poor farmers and other actors within the feed-dairy chain. Mycotoxins are poisonous metabolites produced by various species of moulds. Aflatoxins are cancer-causing mycotoxins produced by the mould Aspergillus flavus. Aspergillus can grow in a wide range of foods and feed and thrives under favourable growth conditions of high temperature and moisture content.